Oscar Alblas is a professional musician who works as an allround percussionist with the Orchestra of the Royal Dutch Air Force. 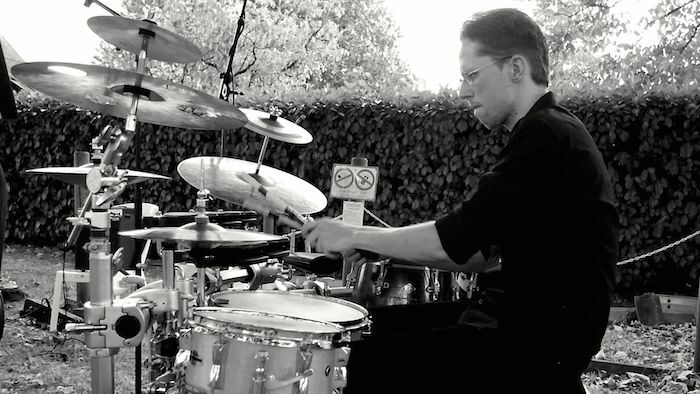 He is also active as a percussionist and drummer in various bands and ensembles. Coming from a thorough (classical) training at Codarts Rotterdam, Oscar has developed himself into a versatile musician. As a freelancer in classical music he performed with, among others, the Marine Band of the Royal Netherlands Navy, Holland Symfonia and the Rotterdam Philharmonic Orchestra. At the same time he performs with jazz, pop and rock groups, and has participated as both a performer and composer in theatre productions by Conny Janssen Danst, OT Rotterdam, Rick Engelkes Productions, Theater Babel Rotterdam and many others. Furthermore, Oscar has been a percussion teacher for over fifteen years. The thrilling "Tenfold Right" is one of many interesting songs in the discography of Kong - not least because of the wonderful drum part. During Kong's show in Switzerland earlier this year the drums were filmed from side-stage. This recording can be viewed above. "Tenfold Right" originally appeared on the album "What It Seems Is What You Get" (2009), available digitallly and on CD via Kong's Bandcamp page.